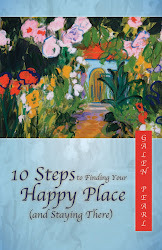 10 Steps to Finding Your Happy Place (and Staying There): I Give You My Shoes! As they strolled along an isolated stretch of sand, carrying their shoes in their hands, they were suddenly accosted by a group of robbers brandishing knives. The thieves circled them and demanded their money and valuables, including their shoes. The man described his terror as he imagined his imminent painful, bloody death, and his helpless failure to protect his friend. As he fumbled with trembling hands to get his wallet out and remove his watch, his female companion drew herself up and faced the leader, who towered over her. In a similar scenario, I read about a Tibetan monk who was crying as he was being tortured by Chinese soldiers. When one of his tormentors ridiculed him for his tears, the monk explained that he was crying out of compassion because of all the bad karma his captors were creating for themselves. In a very different scenario, I walked into my living room one morning years ago and startled a teenaged boy I knew from the neighborhood. He had come in through a door I thought I had locked, and was standing there going through my purse. Fueled by adrenaline, I screamed at him to get out of my house. (I can’t print what I actually said.) He immediately dropped everything and ran out the door and down the street. Emboldened by his reaction, I shouted at him from the front porch, demanding that he return while I called the police. When he kept running (what a surprise), I grabbed my keys and, clad only in my robe, jumped in the car and gave chase. Thank goodness he veered off the street and ran between two houses before I could run him over. To this day I wonder if I would have. He was caught soon thereafter and I testified against him at his preliminary hearing. I remember how angry I was, how much I wanted him punished. I’m sorry about that now. I’m not sorry he was caught, or that he brought legal consequences upon himself. I’m sorry about what was in my heart. And what wasn’t in my heart. There was no compassion or forgiveness, only a craving for vengeance. Anger always masks fear. When I look through my rage, I can see how vulnerable I felt when I came upon him in my home, especially since I had undressed and only had my robe on. I was afraid he might have hurt me. Somehow I felt embarrassed that I had left the door unlocked and “allowed” this to happen. Maybe I even felt ashamed. My anger, on the other hand, gave me a feeling of power and invincibility, long after the threat was over. Even when we are “righteous” in our anger, what does it serve? The heart of the woman on the beach and the spirit of the Tibetan monk were untouched by the harmful intentions of their attackers. Who, then, was truly invincible? This is a brave post, Galen. I would have reacted just as you had. I think it must take a lot of mindfulness practice, especially "metta" or loving-kindness, to react as the woman on the beach or the monk. Bobbi, I agree. The woman and the monk were so brave, brave with the courage that comes from a pure spirit where fear has no place to enter. Thank you for sharing. Very inspiring, as I started my day today feeling some anger and fear. This helps. I remember reading those Reader's Digest books as well. There was always something positive and uplifting to find! DJ, I'm so glad this post was helpful to you. Thanks for commenting. bonkers, Welcome! Thanks for stopping by and I'm so glad you liked the post. I appreciate your comment. The learning is always valuable, Galen. Sometimes we can't help reacting. I love those Reader's Digest stories too - and I was especially lucky that a friend's Dad got the large print version - truly a joy to read. Although the great stories influence us, in some situations we tend to let our instincts take over. I always wonder if I can bring myself to hit someone. Because I cringe every time I see violence. I think of possible situations when I might act out of character :-). So far, I am doing okay. Yikes. Who is invincible? No one. :-) God, maybe. Vidya, I was definitely operating from instinctive reaction then. Now I can see the fear and the closed spirit of my reaction, but then I felt so justified. We never know how we will react in certain circumstances. But with awareness, we can at least let go of reactions that do not serve us. Thanks for commenting. People always do bad out of their own misery! It is always a call for love! Jodi, Your comment echoes the teaching of A Course in Miracles that says everything we do or think or say is either an expression of love or a call for love. That young man was calling for love, but my reaction was also a call for love. Thanks for your comment. Thank you for posting this. I stopped breathing when I read about yourself. When I was twelve years old, I came out of the bathroom. Then I saw a man who had invaded our house, through the only door unlocked door.(balcony). He urged the study room of my father in and I ran down the stairs, ran out to our neighbor. (He was police.) And this forced the burglar to the police station, where he had to sleep a night in jail. For years I have been afraid in the house when I was alone. Only when I was mid-twenties I could forgive this man. He was a disappointed lover of my sister. Jedidja, That must have been a terrifying experience. You were so young. Your forgiveness of that man was a huge step of healing for your spirit. Thanks for commenting. Wonderful stories. Thanks for your self-disclosure. I guess we've all had similar experiences, and worse. Fear does win too often. And, too often we feel so righteous that we think there's no need to forgive. It takes some real introspection to identify our fears. I used to get so angry sometimes at life's injustice. I'm still processing all that anger and trying to find the fear so I can let go of it. Thanks Galen. Your posts always enrich my life. Myrna, Your description is so right on target. It is a process, isn't it? For me, I might react a certain way in fear, but I hope at this point in my life, that I will not hang onto it the way I did back then. Thanks for your comment. Absolutely inspirational, Galen! What marvelous stories you have shared here. You are so right that anger very often does substitute for our fears. In the long run, anger doesn't hurt the object of that anger, it hurts us. Martha, So true. Anger poisons our own spirits. Thank you for your comment. You have the absolute right to get angry - we all would but how do we act in these situations when we are scared and fearful? HOw do we step back and let the compassion wash over us? How do we handle our fear differently instead of manifesting in anger? You've helped show that awareness, at least, is the very first step. I think the second step is try to act from a place of love in every situation. Of course no easy task there - if we could act from there all the time, we would all be realized beings. Vishnu, Looking back, I think my initial reaction in fear and adrenaline might not be any different even today. I don't know. What I hope might be different is what I do when the initial threat is over. I hope I would be able to shift more quickly to a place of compassion and forgiveness. Thanks for your comment. What Powerful Stories... no wonder you remember them even after all these years... such a strong Message they Impart. I too find that when I am reacting in Anger that I distance myself from my Spiritual Side which would Serve me so much better than righteous indignation and an Angry Spirit would. Dawn, I like your observation that our Angry Spirit distances us from our Spiritual Side. So true. Thanks for commenting. I think we'd all like to think we'd respond like woman on the beach and the Tibetan monk but we probably would all respond like Galen Pearl! I hope I never have to find out! Lori, Ha! Well said! I would still probably react like Galen Pearl in the immediate situation, but hopefully, I would shift soon to the attitude of the woman and the monk. Thanks for commenting. I cannot even imagine what I would do. A purse snatcher tried to steal from my friend. Unfortunately the snatcher had long curly hair. My friend grabbed the woman by the hair on both sides of her head, pulled as hard as she could and yelled at the top of her lungs until the woman dropped the purse. That woman ran too...as fast as she could. I think the teacher on the school grounds would emerge immediately in me and that person would get a tongue lashing. But who knows. "Even when we are “righteous” in our anger, what does it serve?" A good question. Barbara, Great story! We just don't know what we would do in the moment. Love the way your friend improvised with the hair! Thanks for commenting. we tell ourselves and our kids, we cannot control most things, people or events in this life...but we can control our reaction to things people and events. Annmarie, So true. That's what I try to teach my kids and remind myself of all the time. Thanks for your comment. The Reader's Digest stories stand out in your memory, Galen, because the people in them reacted differently than most would in the same situation. If they had been robbed or beaten and reacted accordingly, there would be no story, just statistics. We never know how we'll react to a situation until we're in it. But who knows....perhaps our reactions might be tempered if we remember the heroics and compassion of these stories. Susan, That's true. I would never have seen myself acting like a crazy person jumping in my car dressed only in a robe trying to run someone down! Not me in my best light, that's for sure! But you are right about the stories--they are about people who react in inspiring ways. Thanks for commenting. I used to love to read those stories also and many would assist me in working towards being a better person. you know what I am saying...if we want to be non-violent in our response to anger and violence we need to practice, practice, practice. Patricia, you brought up something that is so important. There is a difference between a courageous, compassionate, non violent response--and a response that might look non violent on the outside but is really about fear. Telling someone to STOP can be very compassionate. Thanks for your comment. Wow, I loved this post today. I too remember reading the Reader's Digest and loving the stories. I felt lifted and enlightened by the stories. I know how upset I can get when something bad happens in our family. Right now I have a son who is going to lose his job this week due to some struggles at his work. It is all very sad because it is totally personal. He has a forgiving heart; so I think he will be ok. However, his wife doesn't have a forgiving heart; so it will be a big challenge in their life. Thanks, again for this post; I really loved it. LeAnn, I'm so sorry about your son's job situation. That can leave someone feeling frustrated and helpless. I hope this will open the door for something even better for him. And I hope his wife will find a way to keep her heart open. Thanks for your kind words. I haven't had it happen, but I've wondered how I would respond if I encountered someone in my house. You were so bold and courageous! Thanks for sharing these various responses. We can all learn from each other. Lyn, I was bold and courageous on the outside, but I was terrified on the inside! I think the woman on the beach showed true boldness and courage, just as the monk showed true compassion and forgiveness. Thanks for commenting. Your post made me think of all the "angry conversations" I've had in my head when I think I've been wronged. I can totally understand your reaction. I might have done the same thing. Angela, I think many people can identify with my reaction. I hope, though, that many people, myself included, can aspire to be more like the woman and the monk. Thanks for commenting. I can't stop thinking of how brave you were to pursue him but realize sometimes what we are feeling empowers us to do things like lift cars off of people, and run after someone who could easily outrun us. When we are fueled by our emotions, good or bad our intentions change and I know I too, have been in situations where I really had to questions my hearts motives and my response. I always enjoy your posts. This one was really a favorite! Kathy, As I said above, my actions might have looked brave, but really I was scared to pieces. Adrenaline and fear can be very powerful in one sense, but keeping our hearts open through the fear is true bravery. Thanks so much for your kind words. Great story my friend and like you I use to love reading Reader's Digest - for the same reasons you did. The humanitarian stories of life and love. The beauty of your story is that you may have felt angry at the time but you have come to a point in your life where you operate from love and not fear. We operate from only 2 human emotions - Fear or Love. Nancy, A Course in Miracles teaches just what you said, that there are only two emotions--fear and love. So simple! Thanks for commenting. Adriana, Seems like a lot of us read Readers Digest! Thanks for your comment. I also read readers digest. my favorites were always of the heroes as well. Funny how our memories can be stirred. I probably would have reacted the same way you did if I found someone in my kitchen that didn't belong there. Fear can be a great motivator, but recognize what it is and go on from there. I knew I feared my ex-husband for various reason, all acceptable reasons. But when I refused to show him that fear any longer he left and found a new victim. I learned a lot about fear in those days. This is a great post, thank you. jan, Fear can be a motivator, especially when it manifests as anger, but in the end, it doesn't serve us very well, does it? When you stopped showing fear, the threat left. Thanks for commenting. Great post! I loved Reader's Digest as a child, too! Great to see you! Thanks for commenting. Great post Galen! I can't even begin to imagine the array of feelings I would experience if I ever walked into a situation like that. I believe your feelings were warranted by your circumstance. It is that 'fight or flight' response and sometimes, we just don't have control over it, even if we question it later in time. Thanks for sharing! Mary, Warranted, yes. Beneficial to my spirit? Not so sure. Hanging onto it long after the threat was gone? Not helpful at all. I appreciate your added insight. Thanks for commenting. Wow. That's powerful Galen. I've regretted similar circumstances when I lost sight of compassion and decided to become the harsh judge. When we catch folks doing things wrong and say, “NO,” we become a harming force in the world. This energy attracts NO’s into our lives. This is the spirit of anger and fear. When we catch folks doing things right and say,“WOW,” we are a healing force. This energy attracts WOW’s. When benevolent with WOW, we experience compassion for the confusion that others are experiencing. This is the essence of brotherly love. rob, From Woe to Wow! I won't forget that. Thanks for your comment. This was a very thought provoking post. Even though we have a right to be angry at times, there is always a reason for forgiveness and love. Shanda, You make an important distinction between what we have a right to and what serves our spirit and others. Thanks for commenting. wow, riviting! And something to cew on today for sure, thank you!!!!!!!! sheila, Thanks for the enthusiastic comment! Galen, do you think you would react differently today given the same situation? I know I would be filled with rage and want to run the little so-and-so over with the car. I wouldn't actually do it, but I'd want to. Suzanne, Blogger went down for about 48 hours some months back. Many bloggers had a hard time with that! When it came back, some comments were lost. I, too, have lost photos and writings. It was very difficult. Would I react differently? In the heat of the moment, maybe not. But I don't think I would hang onto it like I did all those years ago. Even in the heat of the moment, I might react the same until he was out of the house, but maybe I wouldn't chase him down trying to run him over with the car. I hope I wouldn't! I see something different in this story. I see the similarity between the unlocked door and you only in your robe. Like it was really a lesson in vulnerability, being exposed or addressing something just under the surface. There are things we all try to hide and keep from the world. The whole time I lived in the suburbs as a married wife(a span of about 12 years)I had panic attacks as I was falling asleep about the garage door being left opened. Like it was this huge gaping hole of vulnerability between me and the world. What is a robe? What is an unlocked door? An opened garage door? They all have the ability to make us feel vulnerable. The monk and the lady on the beach obviously had nothing to hide. She was giving up her shoes to herself, her own anger, her own selfish needs. If we could easily see ourselves in others, both our dark and light, why wouldn't we give our shoes. Nicole, I love your poet's mind! I never made that connection, but I can understand it now that you have described it. What a profound interpretation of what happened, to me and to the others. Thank you so much for enriching the discussion with your thoughts. Galen....Stories like these can help us strengthen our 'forgiveness muscles'. I am in awe of people who are able to be compassionate and forgiving in any situation. They are unwavering in their powerful, courageous actions. They wouldn't think of doing otherwise. Fran, I like that idea of forgiveness muscles, because it implies that we can indeed strengthen them by exercising them! Like you, I do much better now than in past years...most of the time! Thanks for commenting. I'm sure I would have had a similar reaction as you did. We do all need a bit of time to process an incident such as yours. I keep coming back to the idea that there is pain behind these unlawful acts, and when we know the underlying circumstances, we can have more compassion. Enjoyed your interesting post! Cathy, I agree that there is pain behind acts like that, coupled with fear in our reaction to them. Awareness leads to compassion for all. Thanks for your comment. Wonderful story Galen and thank you for sharing it. I to like Readers Digest. I still read it. If you had not reacted as you did, with anger instead of acting with fear, you could have gotten hurt. In your readers digest story the woman did act with kindness and some anger. The thing that she didn't act with was fear. Anytime we are in a bad situation as this, to me it is the fear that helps the thief accomplish his task. When we don't show fear we have a chance of them backing off. My house has been broken into 2 times. (not the one I live in now) The first time I felt fear, the second time it made me anger. Of course i was not home at the time. One other time I came home just as someone was trying to break in. He ran. A few days later I seen this person in the area. I did get in my car and follow him. Called the police to let them know where I was and what was happening. They did catch him. that time there was not fear or anger just you are not going to do this to anyone. thank you for sharing these stories and blessing to you. Debbie, Thanks for sharing your break in stories. It's interesting that you reacted differently every time. The last time it seemed that you were very matter of fact, not acting in fear or anger (since fear masks anger, really the same thing), but rather acted simply to stop the behavior. Thanks for commenting. Wow. I thought it was just another story. Thanks so much. By the way I like how you didn't bother to check out that Reader's Digest article (which is difficult anyway) but instead relied on what you can remember about it. Chris, I'm not sure what you meant about not checking the RD story. I did Google it, but couldn't find it. Too old, I guess. So, as you noted, I told it as I remember it. Thanks for commenting.